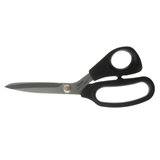 Heavy duty fabric scissors - 21cm (8.25in). Exceptional cutting power, up to 8 layers of fabric. Soft grip comfort. Serrated lower blade.